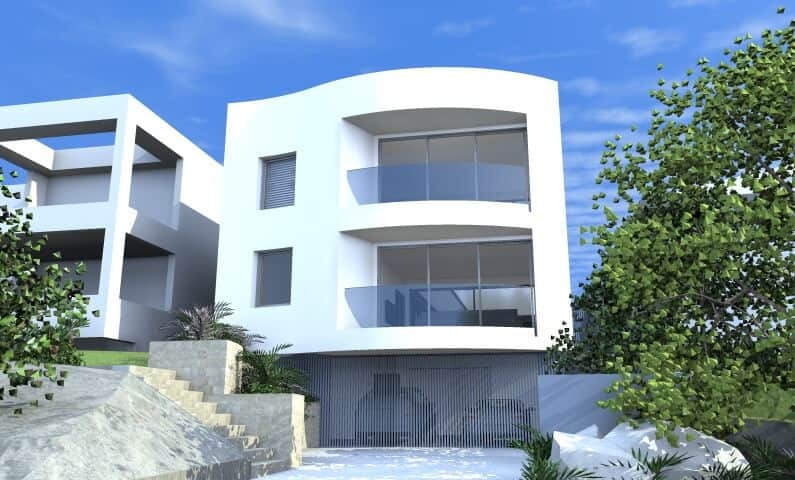 A complementing new 3 level home design with an intricate curved facade situated on the high side of Queenscliff. This home was completed in 2013. We were approached by our clients with a very detailed brief and thoughtful layout for their proposed knock-down, re-build project in Queenscliff. The clients wanted our input to shape their well designed 2-dimensional plan into a 3-dimensional building with an interesting and impressive facade. The site sits on the high side of the street between two very different quality and well-designed homes which meant the look of the home had to be very different again. Contextual issues helped to generate the unique curved design on the two upper levels which, not only takes your attention away from the garage but also softens the 3 level facade which was fairly flat. The concept design was well received by our clients and has since been completed. DA approved by Warringah council in just 8 weeks.